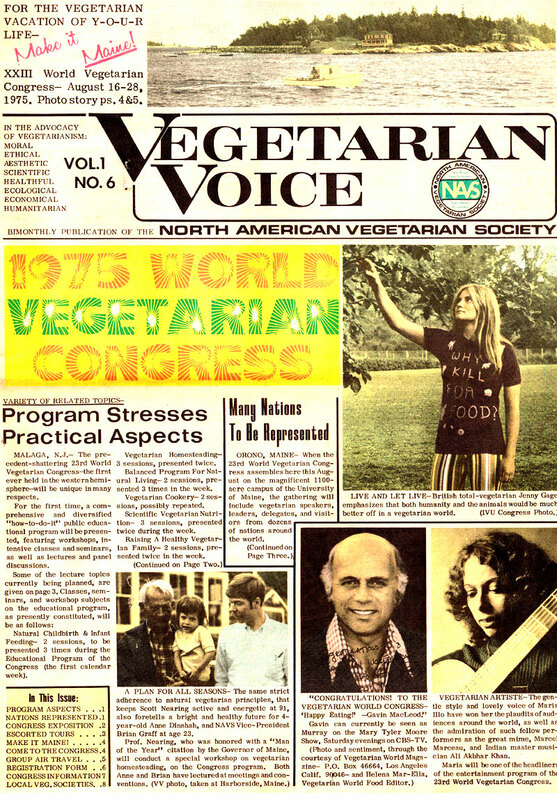 "The year 1975 was an important year for vegetarian advocacy. 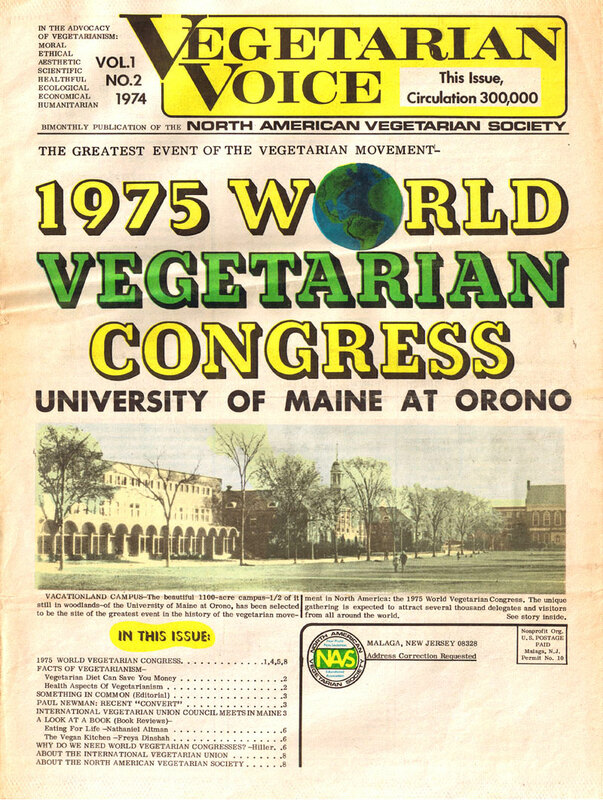 With the formation of the NAVS [North American Vegetarian Society] the stage was set for the 23rd World Vegetarian Congress held in the late summer at Orono, Maine. 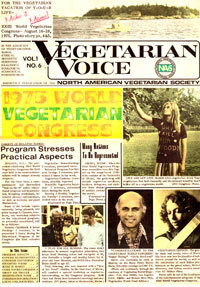 The event marked the first time that the International Vegetarian Union held its congress on American soil. 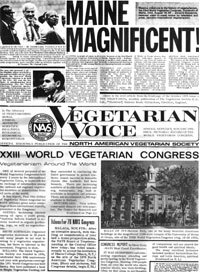 Arguably it was the most important gathering of vegetarians in the United States in the twentieth century." - click on the cover pic to buy the book from amazon.com and IVU gets 15% ! 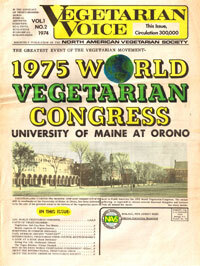 Cover right: Vegetarian Voice, Vol.1 No.2, (Mar/Apr) 1974 - "VACATIONLAND CAMPUS - The beautiful 1000-acre campus - 1/2 of it still in woodlands - of the University of Maine at Orono, has been selected to be the site of the greatest event in the history of the vegetarian movement in North America: the 1975 World Vegetarian Congress. The unique gathering is expected to attract several thousand delegates and visitors from all around the world." - Why Do We Need World Vegetarian Congresses? 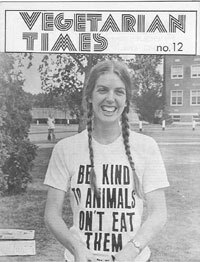 Cover photos: middle right - Live and Let Live - British total-vegetarian Jenny Gage emphasizes that both humanity and the animals would be much better of in a vegetarian world. Bottom-left: A plan for all seasons - The same strict adherence to natural vegetarian principles, that keeps Scott Nearing active and energetic at 91, also foretells a bright and healthy future for 4-year-old Anne Dinshah, and NAVS Vice-President Brian Graff at age 23. Prof. Nearing, who was honored with a "Man of the Year" citation by the Governor of Maine, will conduct a special workshop on vegetarian homesteading, on the Congress program. Both Anne and Brian have lectured at meetings and conventions. 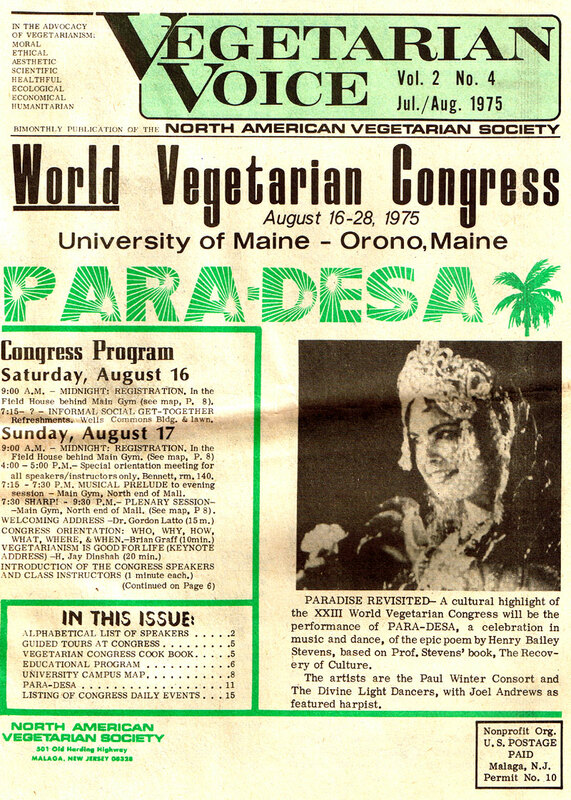 Bottom-middle: "Congratulations to the Vegetarian World Congress - ' Happy eating!" - Gavin Macleod." Gavin can currently be seen on the Mary Tyler Moore Show, Saturday evenings on CBS-TV. Bottom right: Vegetarian artiste - the gentle style and lovely voice of maria Illo have won her the plaudits of auiences around the world, as well as the admiration of such fellow performers as the great mime, Marcel Marceau, and Indian master musician Ali Akbhar Khan. 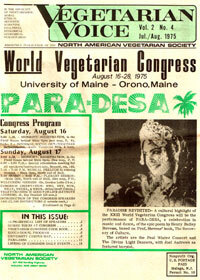 Maria will be one of the headliners of the entertainment program of the 23rd World Vegetarian Congress. photo right: PARADISE REVISITED - A cultural highlight of the XXIII World Vegetarian Congress will be the performace of PARA-DESA, a celebration in music and dance, of the epic poem by Henry Bailey Stevens, based on Prof. Stevens' book, the recovery of Culture. The artists are the Paul Winter Consort and The Divine Light Dancers, with Joel Andrews as featured harpist. Countries represented at the Congress (listed by the IVU General Secretary) : Australia, Austria, Bermuda, Belgium, Canada, Colombia, Curacao, Denmark, France, East Germany, West Germany, India, Israel, Japan, Mexico, Netherlands, Nigeria, Panama, Portugal, South Africa, Sweden, Switzerland, UK, USA, Venezuela, Turkey. Congress People and Activities - photos from the events, some of these were used in the various reports below. Conservation & Recycling of Resources - paper prepared for the Congress by Dr. M. M. Bhamgara, India. Children - from 3 pages of photos - were you there? The Delegation from India | Yoga | Displays | Banquet!